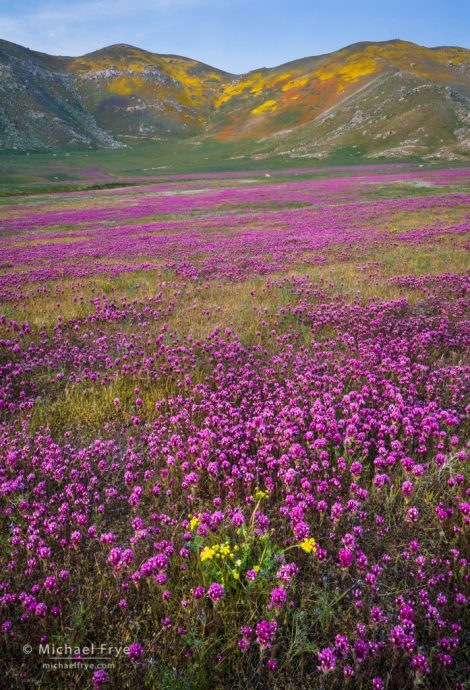 Poppies, goldfileds, owl’s clover, and spring gold, southern Sierra Nevada, California. There were two compositional challenges here: the physical distance between the foreground and background flowers, plus the lack of any distinguishing features in the foreground that could serve as a focal point. I found this slightly-elevated vantage point where I could show the sweep of owl’s clover leading up to the hills, allowing me to fill most of the frame with flowers, so that solved the first problem. And then I spotted this small clump of yellow flowers (spring gold), which added a foreground focal point, and tied in visually with the yellow colors in the background. 27mm, 1/10th of a second at f/16, ISO 800. It’s been a good year for wildflowers in California – above average in some places, and exceptional in a few spots. One of those places that seemed to be having an exceptionally-good year was Antelope Valley, so after our Death Valley workshop Claudia and I made a quick trip down there. We had seen poppies in Antelope Valley back in the late ’80s, but hadn’t been back since, so this seemed like a good time for a return visit. And the flowers were amazing. In the sun the combination of bright, red-orange poppies and yellow goldfields was downright blinding. It actually hurt my eyes to look directly at the flowers. 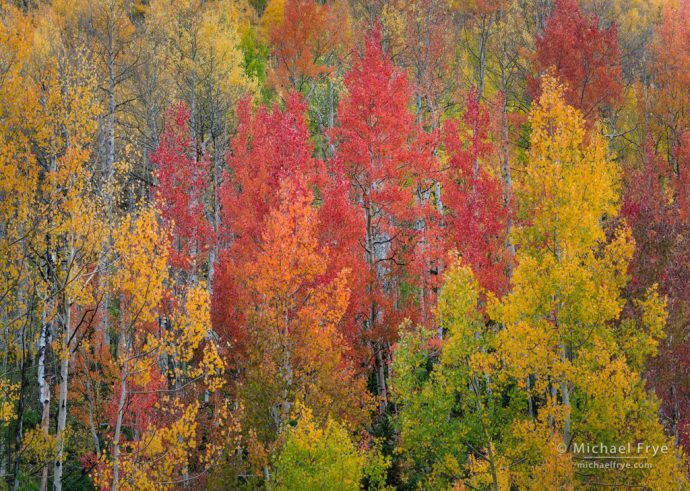 Claudia and I made our annual pilgrimage to Colorado to see the aspens, with a short detour into some Utah canyons. We’ve actually been traveling for three weeks, and just got home. During our trip we got up before sunrise almost every morning, and stayed out until after sunset nearly every evening. I kept thinking that I should post some photos, but there always seemed to be some interesting weather, and photos to be made, and barely enough time to eat, sleep, and then get up at 5:30 and do it all over again. Shooting stars, summer wildflowers, Yosemite. Handheld (a rarity for me) at 1/200th sec., f/4, ISO 400. I’m almost always using medium to small apertures to get everything in focus, but once in awhile it’s fun to use a wide aperture to throw the foreground and background out of focus. I just finished teaching a workshop, so I’m catching up on posting images from earlier this summer. As I mentioned in a recent post, Claudia and I made several trips in June to the higher elevations of Yosemite to look for wildflowers. 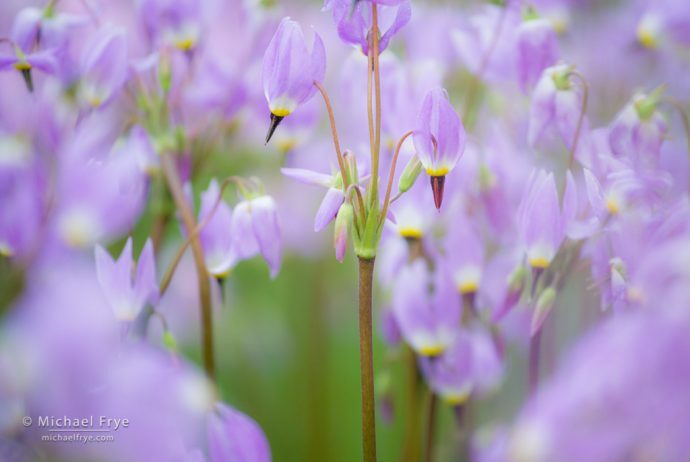 We found many shooting stars, which are one of the early bloomers in the high country. They’re beautiful flowers, but they always grow in marshy areas, full of mosquitos. So over the years my brain has made an association between shooting stars and their accompanying insect pests, and just seeing these flowers triggers a psychological reaction that literally makes me itch. But aside from that initial visceral reaction to the sight of shooting stars, mosquitos don’t generally faze me much. I’ve actually developed a partial immunity to the mosquitos in Yosemite, so bites don’t create welts or make me itch anymore. Mosquitos are still annoying, but a little insect repellent keeps them at bay and lets me concentrate on photographing flowers. We’ve had a series of storms recently. The last of these arrived Saturday and continued into the night. It wasn’t much of a storm; Yosemite Valley received only about three-tenths of an inch of water. But it was cold enough to leave a dusting of snow on the valley floor. It looked like the storm would clear during the night, so I left for the valley around 11:00 p.m. Saturday, arriving just after midnight. But clouds and snow showers kept lingering so I ended up dozing in my car. I woke up around 5:30 a.m. and saw a few stars for the first time. At least the clearing seemed well-timed for sunrise. 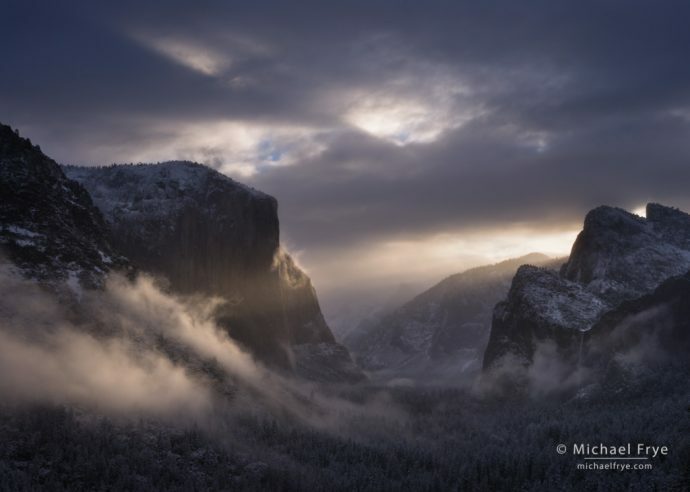 Sunbeams and morning mist from Tunnel View, Yosemite. 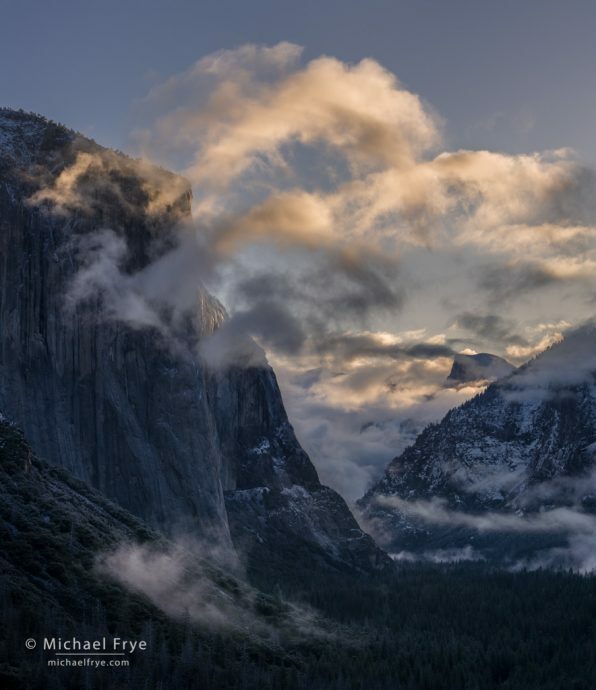 While photographing this dramatic light from Tunnel View a few years ago, I zoomed out wide enough (to 40mm) to leave some dark areas between the bright clouds and the edges of the frame. When you compose a photograph, you put a frame around a piece of the world, at a certain moment, and say, “Hey, look at this.” It’s the frame that creates the composition, and it’s the edges that define the frame. That’s why it’s so vital to pay attention to the edges of your photographs. It’s always a good idea to run your eye around the edges of the viewfinder before pressing the shutter. Look for anything that might be distracting, and see if you can get rid of it. Look for objects that are cut in half along the edge, and decide whether you should include them or eliminate them. The big storm finally ended last night. 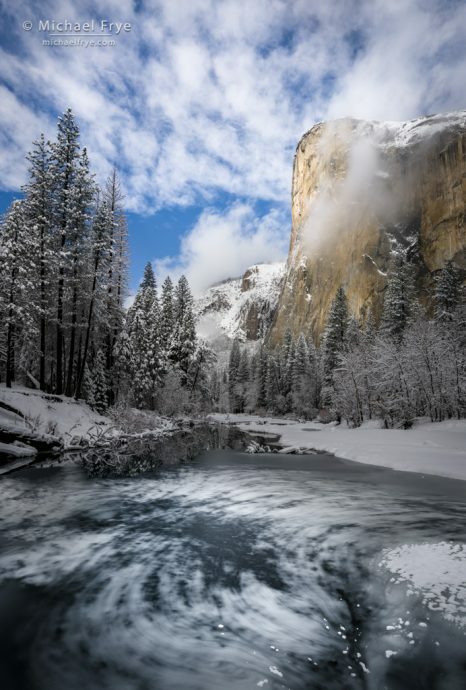 Yosemite Valley received about four-and-a-half inches of liquid precipitation since Thursday. It started as snow, then changed to rain for awhile, and then changed back to snow, with about a foot of snow accumulating on the valley floor. Precipitation for this water year is still well below average, but this storm was a big help. The forecast called for snow showers to continue all day Saturday and linger into the evening. But you never know, so I set my alarm for 4:00 a.m. on Saturday morning in case the storm started to break earlier than expected. After getting rudely awakened by the alarm I checked the radar and satellite images, which showed clear skies approaching from the west. But it didn’t look like they would reach Yosemite Valley until at least a couple of hours after sunrise. And besides, showers often linger in the mountains, and all the forecast predictions showed showers continuing in Yosemite all day. I went back to bed.